Having learned to rely on your own skills, your chest swells with pride as you watch your ships sail into the sunset. There’s no shame in showing off a little. After all, things look promising. Who knows what adventures lie ahead or what riches these ships, your plans put into action, will carry back? The man in the Three of Wands tarot card is the same person as the one on the Two of Wands. He’s left behind the safety of his castle, trading his lordly garments for the pupil’s toga. Now that the theory has been worked out down to the smallest detail, the time has come to set things in motion. And how is that working out for him? As you can tell from the staffs planted in the ground on the Three of Wands, it’s working out nicely! The staff behind him shows that his skills have brought him to a point from which he can clearly see the big picture. Things are looking good: His ships are sailing across clear and calm seas toward distant lands. He can see them, too. The tall mountains show that they are full of opportunity. He is leaning on one staff in the Three of Wands tarot card, meaning that his skills are sufficient to support him – literally! And the staff on his left promises that he will even get better at what he’s doing over time. Speaking of time, his timing is perfect! Astrologically, the Three of Wands tarot card corresponds to the sun in Aries. This celestial body happens to enter Aries on March 21. That’s the first day of spring, a great time for new beginnings. The time for sweating over those books in the cold, grey winter castle has come to an end. Welcome to the school of life! So far, you’re passing with flying colors! Others are taking notice, and they’re willing to listen to any reasonable offer you can put on the table. When the Three of Wands appears upright in a tarot reading, its meanings speak of taking pride in your own strength, learning through experience, and discovering new opportunities. Coming into your own strength has given you wisdom that cannot be found in books. A few bragging rights are in order however, the Three of Wands is also a reminder from Spirit to keep your ego in check. A little pride goes a long way. The Three of Wands tarot card may point to someone who has defied the odds, becoming prosperous despite lacking a formal education. Perhaps this is even a high or college dropout who has become a successful business person. Generally, dropping out of school complicates things, but complications have never stopped exceptional persons. For example, Walt Disney left school when he was only sixteen. 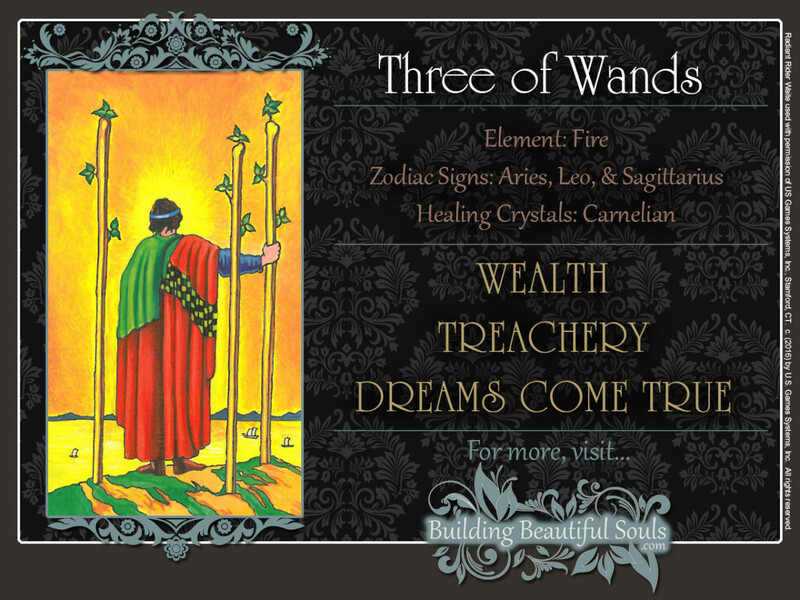 The Three of Wands tarot card is excellent news for any business or career situation! Those resumes you have sent out are generating interview requests. Because your career goals are clearly defined, you’ll be able to choose wisely. The word is starting to get out about your business. More importantly, others are hearing good things about you. Yes, new clients and customers are on the horizon. What’s equally important is that others are interested in partnering with you – or mentoring you. Recent events are showing that you are headed in the right direction. Your efforts are bringing the first fruits of success. Because you have a clear view of the overall picture, you can tell that things are progressing right on schedule. If you’re single and looking, the wait will be over soon. In fact, you’ll be able to choose from several potential partners. But the Three of Wands tarot card is a bit tricky, if you are already in a relationship. The Three of Wands suggests that one of you may be suffering from “wandering eye syndrome.” If that’s your partner, you already know that. The good news is that he or she isn’t physically stepping out of the relationship – and has no intentions of doing so. If that’s you, you better wise up to the fact that your partner knows what you’re doing. True, you mean no harm, but your significant other is hurting. If you don’t stop this soon, you may discover that sleeping on the front porch during a rainstorm is not much fun, at all. When the Three of Wands tarot card is reversed, it’s a sign the Universe is about to put the breaks on everything. Recent developments are slowing down. They may even grind to a complete halt, and this stop may be temporary or permanent. Take a step back and reflect. Your sense of disappointment could be justified. On the other hand what’s happening may be a blessing in disguise. If this is a complication in your personal development, chances are that you’ve overlooked something. You may not have progressed as far as you thought. Your higher power is calling in a reality check. The Three of Wands tarot card reversed is a sign that it is time for you to be completely honest with yourself. Have you mastered the art of self-deception? If so, you’re being called upon to cure that destructive pattern. Should you heed the call to “awaken” (personal or spiritual development) total commitment is the only way to ascend. No cheating or shortcuts allowed. The important thing is to turn these obstacles into learning opportunities. True, not all setbacks are of your own making, and not every trying situation has a silver lining. Sometimes, things just don’t work out. The Three of Wands tarot card may also tell you that a relationship or friendship is coming to an end. It’s no one’s fault. You’ve just been growing apart for some time. Cherish the good memories, end things clean, and don’t resort to vindictiveness. Sometimes, the Three of Wands tarot card also points out that you are ready to return to the world after period of journeying inward. Kabbalistically, the Number 3 is associated with Saturn in his creator aspect. In traditional Numerology, threes correspond to Jupiter who blesses success with more success. The vibrant energy and gusto of the Suit of Wands is especially appealing to the generous side of these very powerful energies.